Should You Be Concerned About Defaulted Venezuelan Bonds? Venezuela defaulted on its sovereign bonds and the debt of its state-run oil company Petroleos de Venezuela, or PDVSA, on November 16. That was nearly two weeks after Venezuelan President Nicolas Maduro announced intentions to restructure the country’s debt pile of more than $60 billion, prompting a further sell-off in the already low-priced bonds. Over the past few years, Maduro’s mismanagement of PDVSA has led to a crippling recession and shortages of food and medicine despite the country’s massive crude oil reserves. And Maduro’s recent takeover of the legislature led to U.S. sanctions on trading newer bonds and dividend payments from Citgo, PDVSA’s U.S. oil-refinery arm, back to Venezuela. Venezuela had serviced its sovereign and PDVSA bonds against an increasingly dire economic situation and dwindling pile of reserves, estimated at less than $10 billion, up until late October. At that point, it fell into grace periods on two bonds for both the sovereign and PDVSA that expired on November 13. That spurred S&P to declare a selective default on the same day that creditors met with government officials in Caracas. In that meeting, creditors were not told of any reforms that the country would undertake in a restructuring agreement. Investors in emerging-markets bond funds are the most likely to have exposure to Venezuelan debt. These funds typically use the JPMorgan Emerging Markets Bond Index as a benchmark, which focuses on hard-currency denominated sovereigns and quasi-sovereigns. For the first 10 months of 2017, the index had a roughly 2.5% stake in Venezuelan debt. The benchmark’s Venezuelan bonds slid by 8% in aggregate for the year to date through October, and Venezuela was the only country in negative territory for the period, the index and typical emerging-markets bond fund were up by 9% and 10%, respectively. For much of the year, most PDVSA and Venezuelan sovereign bonds had been trading at 30-50 cents on the dollar, by far the cheapest bonds in the index, with a yield of more than 30%. In the few days leading up to Maduro’s announcement on November 3, the bonds were already selling off. They took another hit right after, especially the shorter-dated bonds and the sovereigns, putting most of them in the $0.20 range. What Do the Professional Investors Think? Leading up to the recent turmoil, several long-term Venezuela investors found ample reason to stay the course. Some even added to their positions on weakness. The BlackRock emerging markets bond team sees three possible scenarios: In the first, Maduro begins to negotiate a restructuring but also continues to service all debts. In the second, Venezuela runs out of cash and defaults on both PDVSA and the sovereigns. Lastly, the team thinks that Venezuela could selectively default on the sovereign in order to prioritise payments on PDVSA’s debt, thereby avoiding a legal fight that could have an impact on the oil industry. Given these views, the team has been focused on longer-dated PDVSA bonds, arguing they’d be likely to benefit most under any of these scenarios. T. Rowe Price Emerging Markets Bond has held one of the larger Venezuela stakes; 5.5% on October 31. Its manager believes that if the government truly wants a negotiated restructuring, some political reforms will be a prerequisite for the U.S. allowing creditors to engage. The manager does not see progress on that front but thinks it’s very likely that the regime and the economy will come under more severe pressure after a default, which could spur political change. Even assuming a more bearish scenario for bondholders in a restructuring, the manager sees significant long-term potential upside and has favoured shorter-maturity and lower-priced longer-dated bonds. Taking cues from his experience with Ukraine’s default, the manager believes shorter bonds will be offered favourable terms to encourage participation in a re-profiling or restructuring. Other emerging-markets bond managers have exercised caution. Neuberger Berman EM Debt Hard Currency had an underweighting to Venezuela as a result of the team’s deteriorating outlook. Currently, the team fears further downside risk, arguing that the odds of a successful debt renegotiation by the current regime are close to nil. Pictet-Global Emerging Debt had an underweighting in the 1–5 year maturity bucket and an overweighting in the 5–10 year maturity range (1.5% total in Venezuela as of Oct. 31), where it believes there is less downside risk and greater upside potential in case of a regime change and/or favorable debt-restructuring terms. Not all emerging-markets bond funds own Venezuela, however. Templeton Emerging Markets Bond, which is benchmark-agnostic, hasn’t owned Venezuelan debt since mid-2014 because its management team was discouraged by the country’s lack of transparency. 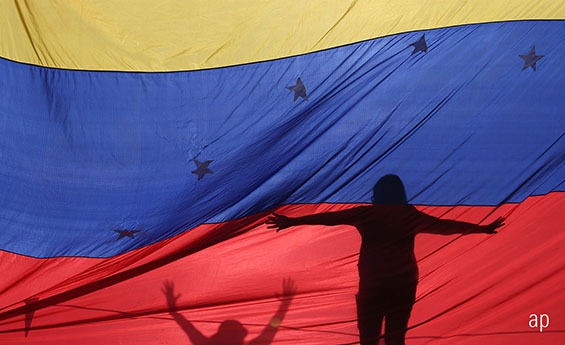 Emerging-markets bond exchange-traded funds can still own defaulted Venezuelan debt, and positions will be adjusted based on market estimations of the value of the restructured debt. That said, Venezuelan bonds could come out of the index if they fail to meet liquidity requirements for inclusion. While not currently an issue, a lack of liquidity could become a bigger problem if the United States imposes more-severe sanctions on trading. In any case, this situation could take a long time to resolve. Ukraine’s far less complicated sovereign bond restructuring took the better part of a year. Maduro’s stranglehold on the government is a major roadblock, and so are U.S. sanctions. As long as those sanctions are in place, U.S. business entities can’t participate in any restructuring. Oil prices are another key variable here. Investors in core and global bond funds have little to fear, as most of these funds haven’t owned Venezuelan debt. For investors with exposure to dedicated emerging-markets bond funds, the recent turmoil isn’t reason to sell. The already low-priced Venezuelan bonds’ recent sell-off hasn’t done much to damp these funds’ solid gains for the year to date. Venezuelan bonds have taken many hits over the past five years, several traded in the $0.80 to $1 range in 2012, so current prices already incorporate a lot of bad news. And some veteran managers see good long-term potential from these very low bond prices. Should You Still Invest in Bonds? Is Your Corporate Bond Fund Riskier than it Looks? Karin Anderson Karin Anderson is a senior mutual fund analyst with Morningstar.